�Soteli� is a classic story of our society where a happily married couple gets to rejoice the birth of their son after many prayers. But the mother leaves her husband and son due to a terminal disease. This trauma leaves their pampered son in a state of delusion, and when the father remarries, the situation worsens.The young boy gets further agitated and left out, due to his step mother�s bad behavior. 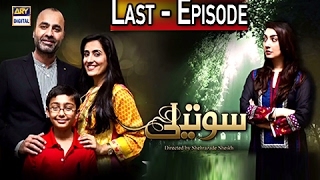 The father eventually realizes the gravity of the situation, but a dent has been made on his son�s personality forever.Director: Sheherzaade SheikhWriter: Seema GhazalCast: Ayesha Khan Deepak Perwani Sabreen Hisbani Aashir Wajahat Saba Faisal Shehzad Shaikh Sadia Faisal and others.